Thursday dried up which made the bike commute a lot more pleasant, even if afternoon puddles did still give me a mini-stripe. I rode down to catch an early train, settled Brompty and I into our seats, and then another Brompty got on, this one tucked lovingly into the second storage slot before its rider looked at me inquiringly and asked, “Are you Kate?” Yep, that’s me! A. and I have never met, but we’ve meant to talk about our bike commutes to UMBC for over a year. Finally! She rides only this Brompty, and she filled me in on some secrets, like the 77 bus on rainy days, and the slightly less hilly way to campus if you take the left at the light instead of just after. We complained about the same hill into campus and the same lack of transportation alternatives and how much we wish they’d bring back the shuttle between the city and campus and on and on because we are each other’s people. The ride back was quick and easy, the slow climb up to Charles Village from Penn Station. I stopped to snap this picture on Charles, just before North Avenue, because hey! Where’d the sign for Club Choices go? Why was their pink awning on the ground, and what’s that black and white striped awning doing on the back of that truck? 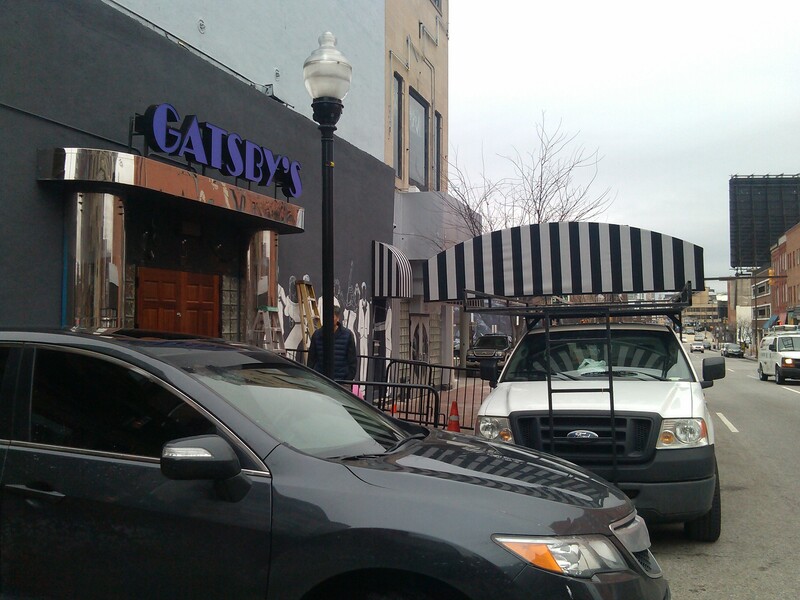 And what the hell is Gatsby’s??? When I got home I did a little googling around, as a girl does these days, and found no mention of the move, and little mention of Club Choices, even. The place has a dress code–dress to impress–and there’s a website that will help you plan a party there, but there are no Yelp reviews or Facebook pages or stand-alone websites to give me the low down on this club that caters to a primarily Black clientele. Club Charles, right across the street, is a different story, having a web-based life that makes what I’ve always considered a bit of a dive sound like a trip back to Victorian times. It was a good reminder of just how segregated Baltimore social life is, and how that segregation travels not just just in physical, but virtual space as well. It just isn’t true that “we” are all on the internet in the same ways at the same time, and my travels even just in the two block radius from the train station confirm that “we” aren’t always in the same neighborhood, even if we’re all in the same neighborhoods. This entry was posted in bikes, neighborhoods and tagged Brompty, Club Charles, Club Choices, commuting, Gatsby's, Station North. Bookmark the permalink. Gatsby’s used to be a mecca way back in the 70s and early 80s. It was Baltimore Club Culture! Along with Odells , and the Paradox!!!!!! It appears that it is returning????? Gatsbys will be back open some time in 2017. The original owner had passed away and is now in control of the daughter and she’s excited to get this one of a kind blues jazz bar back up once again.